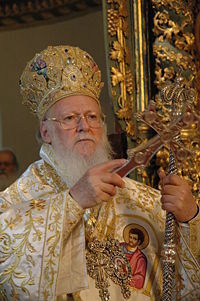 Bartholomew I, Archbishop of Constantinople and Ecumenical Patriarch. The term patriarch (from Greek πατήρ (pater) meaning "father" and ἄρχων (archon) meaning "leader") has several distinct meanings: originally, in antiquity, it referred to a man who exercised autocratic authority over an extended family. The system of such rule of families by senior males was called patriarchy, from which we derive the modern use of the term. Second, in the Biblical context, Abraham, Isaac, and Jacob are referred to as the three patriarchs of the people of Israel, and the period in which they lived is called the "Patriarchal Age." Third, in an ecclesiastical context, the highest-ranking bishops in Eastern Orthodoxy, Oriental Orthodoxy, and the Assyrian Church of the East are called patriarchs. In the Hebrew Bible, the Patriarchs (also known as the Avot in Hebrew) are Abraham, his son Isaac and his grandson Jacob. Collectively, they are referred to as the three patriarchs (shloshet ha-avot) in Judaism, and the period in which they lived is known as the patriarchal period. Their primary wives – Sarah (wife of Abraham), Rebeccah (wife of Isaac), and Leah and Rachel (the wives of Jacob) – are known as the Matriarchs. Thus, classical Judaism considers itself to have three patriarchs and four matriarchs. In the New Testament, King David is referred to as a patriarch, as are Jacob's twelve sons (the ancestors of the Twelve tribes of Israel). In addition, the title patriarch is often applied to the ten antediluvian figures Adam, Seth, Enos, Cainan, Mahalaleel, Jared, Enoch, Methuselah, Lamech, and Noah. According to the Book of Genesis, these ten men are the ancestors of the entire human race. Moses and Joseph are also known as patriarchs. Rome (Saint Peter and Saint Paul), the only Pentarch in the Western Roman Empire (now Italy). In the fourth century, these constituted the four most important cities of the Roman Empire, plus Jerusalem. Some traditions see this as a process of development: At first, only the church leaders in Rome, Alexandria and Antioch were widely acknowledged as having spiritual and juridical authority in the Christian church; the position of Jerusalem gained importance at the First Council of Nicaea, and Constantinople at the Council of Chalcedon. The Council of Nicea also established the supremacy of honor of the apostolic sees as follows: Rome, followed by Alexandria, followed by Antioch, followed by Jerusalem. This hierarchy was only one of honor among four equal Apostolic Sees. When Constantinople joined the group it was ranked second after Rome. After the Arab conquests of the seventh century C.E., only Constantinople remained securely within a state calling itself the "Roman Empire," whereas Rome became independent (see Gregory the Great), Jerusalem and Alexandria fell under Muslim rule, and Antioch was on the front lines of hundreds of years of recurring border warfare between the Byzantine Empire and the Arab Caliphate. These historical-political changes, combined with the northward shift of the center of gravity of Christendom during the Middle Ages, and the fact that the majority of Christians in Muslim-ruled Egypt and Syria were Non-Chalcedonians who refused to recognize the authority of either Rome or Constantinople, meant that the original ideal of five great co-operating centers of administration of the whole Christian church grew ever more remote from practical reality. As part of the Pentarchy, the Pope's Patriarchate of Rome was the only one in the Western Roman Empire. It was roughly coterminous with present territory of the Latin Rite. In the past, popes have used the title Patriarch of the West. However, this title was removed from a reference publication issued by the Vatican in 2006. Today, it would be difficult to identify a leading claimant to the patriarchate of Antioch. There are five claimants to the patriarchal throne of Jerusalem dating from the time of the Crusades. These include Maronite Catholics, Melkite Catholics, Syriac Catholics, Eastern Orthodox, and Syriac Orthodox. The Patriarch of All Bulgaria and the head of the Bulgarian Orthodox Church in Bulgaria. The Archbishop of Asmara and Patriarch of All Eritrea and the head of the Eritrean Orthodox Tewahedo Church in Eritrea. The Catholicos-Patriarch of Seleucia-Ctesiphon, head of the Assyrian Church of the East in the Near East. The Catholicos of Jerusalem of the Church of the East and Abroad. The Patriarch of the East Indies a titular patriarchal see, united to Goa and Daman. 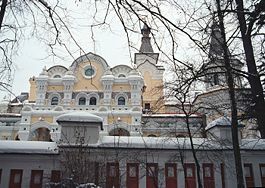 Summer residence of the Patriarch of Moscow in Peredelkino. 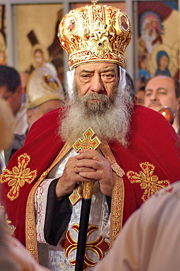 In the Church of Jesus Christ of Latter-day Saints, a patriarch is one who has been ordained to the office of Patriarch in the Melchizedek Priesthood. The term is considered synonymous with the term evangelist. One of the patriarch's primary responsibilities is to give Patriarchal blessings, as Jacob did to his twelve sons in the Old Testament. In the main branch of Mormonism, The Church of Jesus Christ of Latter-day Saints, Patriarchs are typically assigned in each stake and hold the title for life. ↑ Catholic Encyclopedia, Kevin Knight, 2007. Retrieved January 22, 2008. ↑ Cindy Wooden, Vatican removes title 'patriarch of the West' after pope's name, Catholic News Service, Retrieved October 31, 2007. This page was last modified on 2 April 2008, at 13:57.